Well, I've officially turned 35 (at 7:04am) and I'm feeling okay :) All your wonderful birthday wishes are really cheering me up! And a super thank you to my cool Secret Pal, who sent me an Elann gift certificate this morning. Thanks again Secret Pal!! Well, I'm off to make some coffee. . .
Angel Wave & the dreaded birthday. Look what my Secret Pal 4 sent me! Chocolate Covered Espresso Beans (combining my love of both coffee & chocolate! 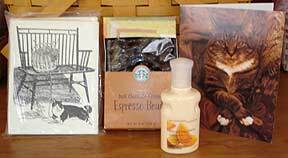 ), cute knitting/kitty notecards and some nice Mango Mandarin lotion. Thanks SP4! YUM! It's Lorna's Angel in the Purple Club colorway. I've been lusting after yarn since I saw Theresa's ribbed Angel scarf. Now, I'm a lover of seed stitch, and I was determined to make a seed stitch scarf with this yarn, but after knitting a few inches, I just wasn't feeling it. I'm now thinking of making a stockinette stitch scarf with a seed stitch border. Or I may just use Theresa's pattern and go for the ribbing. Heck, since I wrote this post back on Friday the 18th, I may already have the scarf finished! The Knitted Rug : 21 Fantastic Designs by Donna Druchunas. All of you subscribers to Interweave Knits will have gotten a taste of this book, as there is an article starting on page 102 written by Donna Druchunas, and a pattern for one of her rugs on page 104. If you enjoyed the article, or are just interested in learning more about knitted rugs, I highly recommend the book. Druchunas devotes a section of the book to the history of the knitted rug, including some beautiful color photos. Another section covers techniques, including finishing and care of finished rugs. Then there are the patterns! The Handspun Spiral rug is stunning. And there are several others that I could see myself knitting, including the Country Kitchen Moss Stitch rug, the FairIsle In-the-Round rug and the Mediterranean Mosaic rug. Check it out! Speaking of knitting books, I have quite a collection. For some reason I got it into my head to create a page on my blog devoted to knitting book reviews. I'm working to get all my books input and I hope to launch the book review portion of the website sometime in the next month. What do you think? or, how do you photograph something this big? Well, there she is! I have to tell you that this was a very fun project and I did not get bored knitting it. I think the secret to project completion was the use of Noro Silk Garden. This was my first project using this yarn and now I'm hooked. So soft and the colors are just perfect for me (I used color 84, I believe). I've already worn my Clapotis several times and I'm sure I'll be wearing it a lot. Here's a close up just for fun. Tomorrow I reveal the fibery goodies that have recently entered my life. Here we have a little swatch that I knit up on Wednesday night at the Joliet Knitting MeetUp that I organize. The yarn is Jo Sharp's Infusion Rare Comfort Mohair that was generously sent to me by Donna. Thanks Donna! The swatch is done using the pattern of the Jo Sharp scarf in Scarf Style (I *love* this book!!) I had asked opinions on this yarn in this post. I did get a few opinions, mostly good, and I really enjoyed knitting with this yarn. I mean, look at it! The colors are gorgeous. Having said that, I found it a bit scratchy -- *sob*. I'm a bit sensitive and this just won't work for a scarf that will be touching my neck. I also asked about Rowan's Kidsilk Haze in that same post and Theresa generously gave me a sample of that to swatch. I don't have the needles free yet, but I will be swatching that soon. Thanks Theresa! Next post. 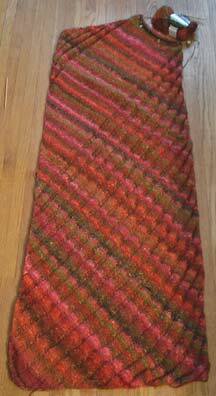 . . pictures of my finished Clapotis! So much to do. . . I have lot to blog about, but no time to write a post. Maybe tomorrow! Tonight I just want to announce the second meeting of the . . .
Maryland Sheep & Wool 2005! Theresa and I got together last weekend for some shopping, chatting and trip planning. That's right, we're going to the Maryland Sheep & Wool Festival this year. I'm so excited!! I finished Clapotis and I bought some goddies this past weekend, but it is dark, grey & rainy here, so I'm not even going to try to take pictures today. So come back later this week! The Heart is a Lonely Hunter by Carson McCullers. This was an excellent book that did an incredible job of taking you to a different time and place. McCullers is an excellent storyteller, bringing various characters to life and involving you in the raw and unadorned aspects of their day to day life. I was caught up in the reasons for each character's actions. It is a book that will not only open your eyes to a part of American history, but also make you think about enduring human ideas an emotions. A timeless classic. Next up is The Virgin Suicides by Jeffrey Eugenides. Now, I had seen the movie several years ago and it was somewhat disturbing, but perhaps not as disturbing as the book. Don't get me wrong, I really enjoyed reading it and flew through it quite quickly. However, it is the story of a bunch of sister's committing suicide, so if you are a little quesy about that kind of thing, this dark novel may not be for you. Eugenides has a powerful writing style which you can see developing in this, his first novel. I have also read Middlesex: A Novel, his most recent (and perhaps only other?) work and found it to be excellent. Heck, not just me -- he won the Pulitizer Prize for fiction for his second novel! It's about a hermaphrodite (yep, he's not shying away from the contraversial topics once again) who discovers his true self. I couldn't put this book down! While Eugenides gives you a deep understanding of the main character, he also creates an epic feel -- covering three generations of the main characters Greek-American family. This is really a must read. Right now I am about 2/3 of the way through The Plot Against America: A Novel by Philip Roth. Very good book so far, I'll write my official "book report" after I finish it! Last year Pete shaved his head to help fight childhood cancer through a wonderful organization called St. Baldrick's Foundation. This is a cause that is very near to our hearts. Pete lost a brother to brain cancer and recently lost his father to colon and liver cancer. I also had a sister with brain cancer in her youth and she is healthy (& pregnant) now. And here's a link to Pete's post about St. Baldrick's. If you can give, even if it's only a few dollars, we would really appreciate it! And so will the chilren who you will help to save! Thank you in advance!! First of all, thank you so much for all the nice comments that you all left for Pete and I about the passing of his dad. I really appreciate it! We have all had the lingering flu for the past couple of weeks. I haven't been up to knitting anything until the last few days, but since they were designated "recovery days" for us here, I finally got some progress made on Clapotis. Yesterday I got so close to finishing! Perhaps tonight will bring me to the end. And I know that people have had lots of trouble with the yarn requirements on this project, but it looks like I am going to make it through with only 6 skeins of the Silk Garden. Noro Transitions -- So expensive, but so tantilizing! THe Yarn Market has a decent price and good pictures of the colors. I'm usually not a "blue" person, but color 08 looks so beautiful. Anyone know a good place to get this yarn at a good price? And is it worth it? Rowan Kidsilk Haze -- I think I'm way behind the times on this one. Didn't lots of people make a shawl out of this a while back? It seems awful expensive, but Dewberry is my color! Anywhere to get this at a reasonable price? 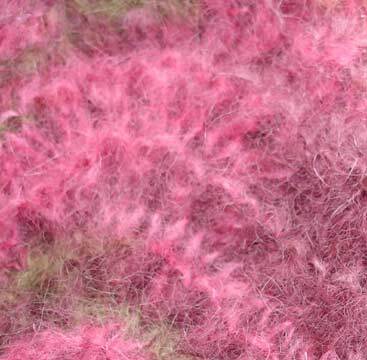 Habu Mohair Tam -- Great colors! (What is it with me and mohair?) 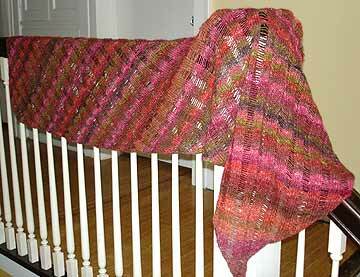 And it just looks so pretty put up in those rectangular balls/skeins. 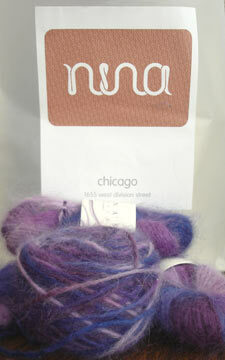 I might have a chance to see this in person this weekend on a trip to a new Chicago yarn ship with Theresa. Yeah! Has anyone used any of the Habu yarns yet? 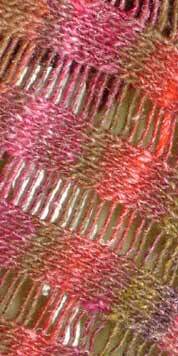 Jo Sharp's Rare Comfort Mohair Infusion -- (Okay, I've lost my mind. Another mohair?!?) I've been obsessed with this since I saw the scarf in Scarf Style. But is it too itchy? I just love the color of the scarf in the book -- 617, I think? And finally -- the new KnitPicks yarns -- I've seen a few people around the ring have bought some of this stuff. How is it? What have you tried & did you like it? It's such a great price, that I am tempted to buy a few different things just to try. Let me know your thoughts on this stuff. Well, I'm off to have my morning latte. Can't wait to hear everyone's opinions!